What a great way to end the year. 2013 has been great for us in the show ring. Riki has achieved in this year alone - an entire Supreme championship! Over 1000 points earned and 10 best In group wins, a Reserve In show and numerous class in show wins. This means that he has earned his Supreme twice now. Myah whilst not gaining her Supreme yet is so close. Not a bad achievement for an oldie who was out of the ring during her prime years. She should gain this award in the early part of 2014 hopefully before we have her second litter of babies. We have had many new owners come to join us in the Theldaroy family with 3 litters of lappies all in the quarter of the year. Achievements from those litters are evidenced below. We hope that these wins will continue for their families into 2014. What an exciting weekend we had for the Suklaa and Keep Litters. They had their first shows this weekend. Jeff and Hill rang from Adelaide to say that Coco - Theldaroy Suklaa Ylakannella had won Bay in Group and showed like a pro. Kira Sergiacomo and her mentor Melissa Purich were excited about Ryker -Theldaroy Suklaa Crispello's Baby in Show in Darwin. We gained 2 baby in groups with Styler - Theldaroy Keep The Style and Riki won his 19th Best in Group and 26th Reserve in group. Maddie - Ch Theldaroy Call Me Madam has had her puppies. Photos can be viewed on our Facebook page and on the Young litter page. 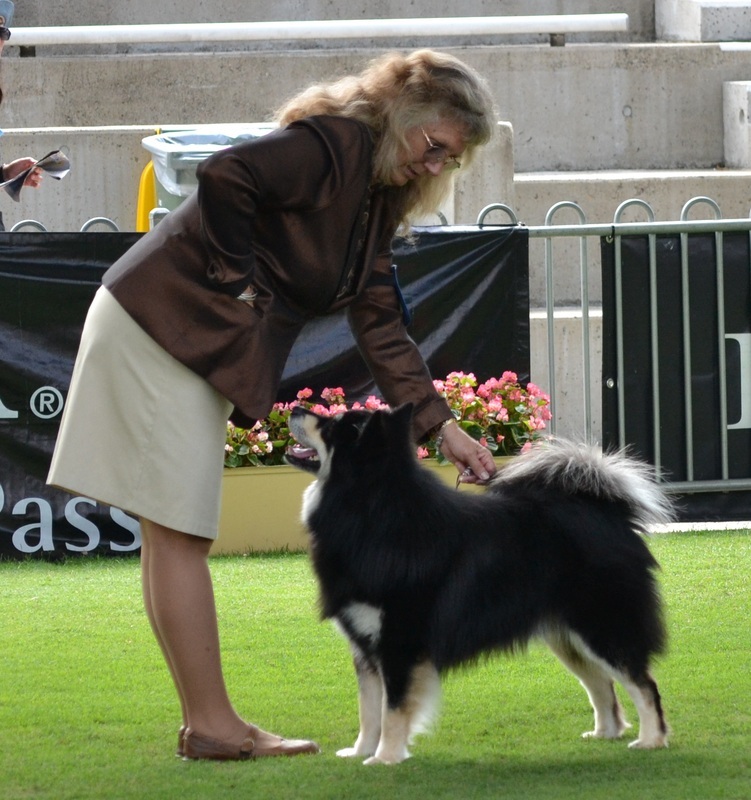 Best of Breed: Supreme Ch Theldaroy Anyone Dare To Diffa: Correct type, excellent head and expression. Good body. Correct movement, excellent coat and condition. Well presented. Best Puppy: Korpi Desert Orchid (out of Riki's sister Ch Theldaroy Any Chance For a Kiss and Ch Theldaroy So Ezy To B Me: Typical femine, excellent head, good body and topline. Excellent coat for age. General Comments on breed: Excellent general quality. Good in type, size, coats and balance. Friday the 8th was a mix of excitement and anxiety as 7 of our pups went to their new homes. We are always excited about getting photos and updates about how they are going. Most of the pups were well behaved and taking their new environments and families in their stride. 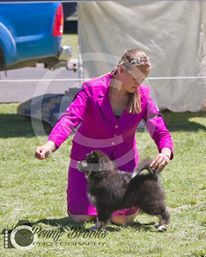 What can i say about Myah's escapade at the Maree Kennel Club Cup Day show. She escaped my lead just as we were ready to do the BCC and ran around the Utility and Non Sporting rings. She came back to me and rolled as I collected her lead to the applause of the other exhibitors. She obviously did not think that going around the ring several times was enough exercise for her. We travelled to Armidale, NSW for the New England and Celtic shows. What a weekend we had! Riki- Sup Ch Theldaroy Anyone Dare To Diffa won his class in show on 2 of the 3 days as well as Best in Group on 2 of the days and his class in group on the other day. 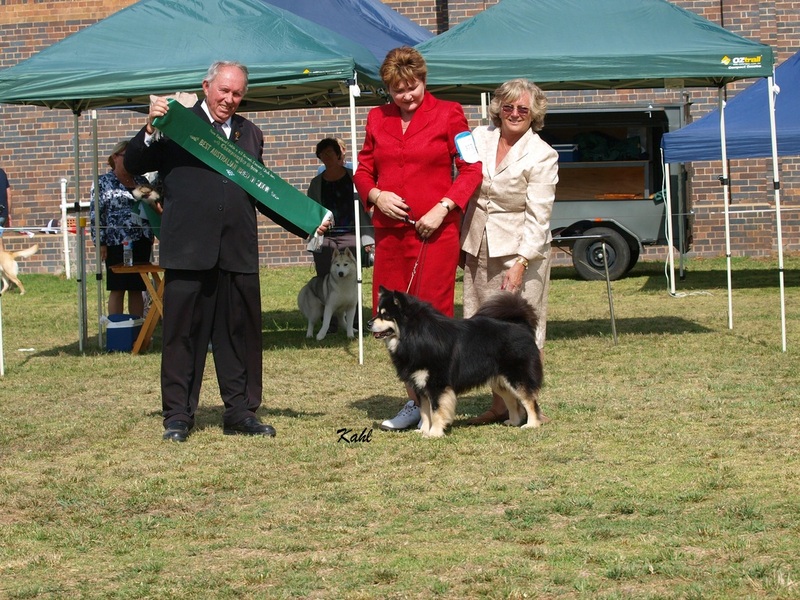 He was congratulated by the specials judges on the days that he won group and was told that he was next in line for the Best and reserve in show awards. Dam!!! Still so pleased with him though. Myah - Ch Theldaroy Moonlite Stryk ET who we went for points on did not achieved any at all going reserve of breed on 2 of the days. She went Open in show and reserve in group as well on one of those days. Overall we had a great weekend other than my falling in the ring - still could not get the sympathy or old age vote!!!!!!!!!! Thank you to all those who showed concern for my well-being after my splat. 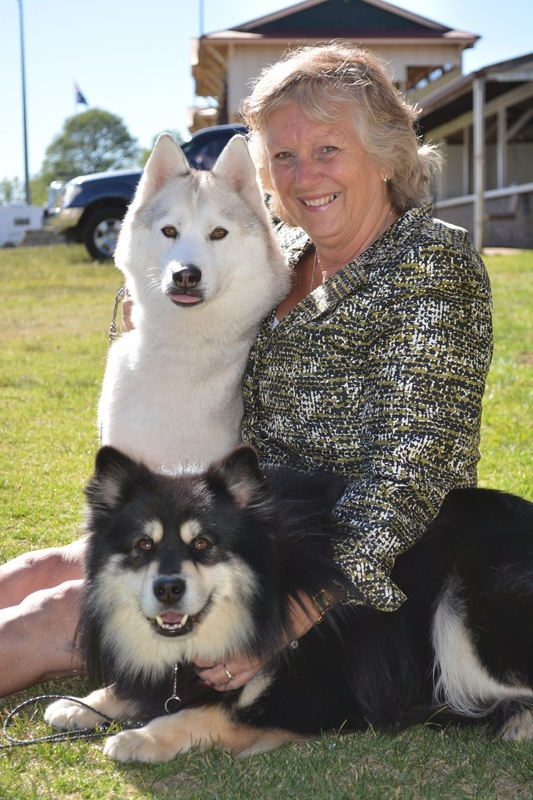 A special thanks to Sherrie Lilley for showing my dogs in specials after we eliminated her. Nothing like Myah photo bombing Riki's picture. The last one was a photo taken by the local Newspaper. Excitement is developing here with many of the pups ready to go to their new homes next week. flights are being booked and arranged. names are being chosen and homes are being readied for their new family members. All pups that are available have been sold except for Manni from the Keep litter who is only available to a show home. We took the pups to the vets this morning for vaccinations, health checks and initial heart checks. Good news and not a problem in sight. Oops some boys are missing their jewels at present but that I can live with. The Suklaa litter are booked in for their cardiologist certificates on the 7th November. 1 Reserve in Group, 1 Best in Group and 1 Runner up to Best In Show. This is his first major award and we hope not his last. After 18 Best in Group and 27 Reserve in group awards he has cracked a BIS 2. Yeah Riki. Thank you Shane Avery the BIS winner for this photo. Congrats Shane on your first BIS award as well. 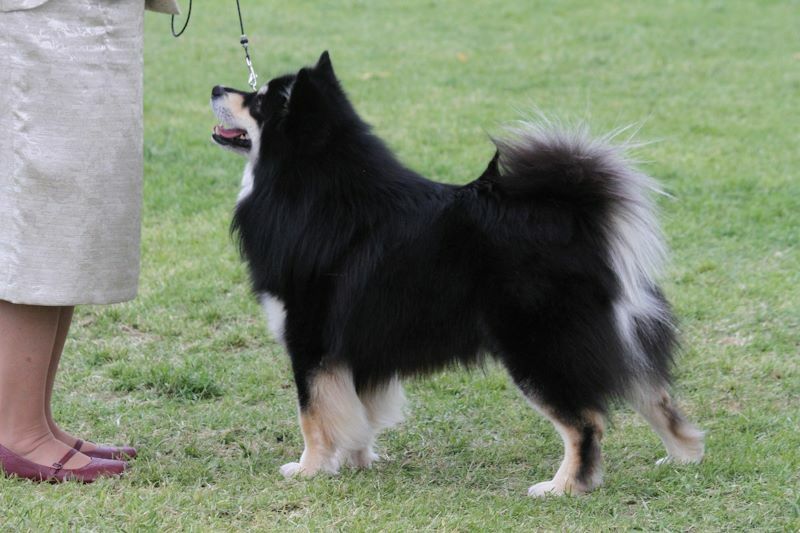 We are pleased that Riki won the Best of Breed at the Brisbane Ekka again this year. Due to the desire to catch up with my children we took the trip to Melbourne. I had entered the lappies on a spur of the moment and took them with us. 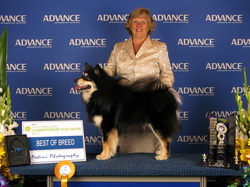 Riki won Best of Breed over a wonderful group of lapphunds. His challenge was a big 25 points. This meant that he also came home with the Theldaroy trophy which is wonderful as this has not been in our home for 10 years. Myah is closing in on her Supreme championship with less than 70 points to go. 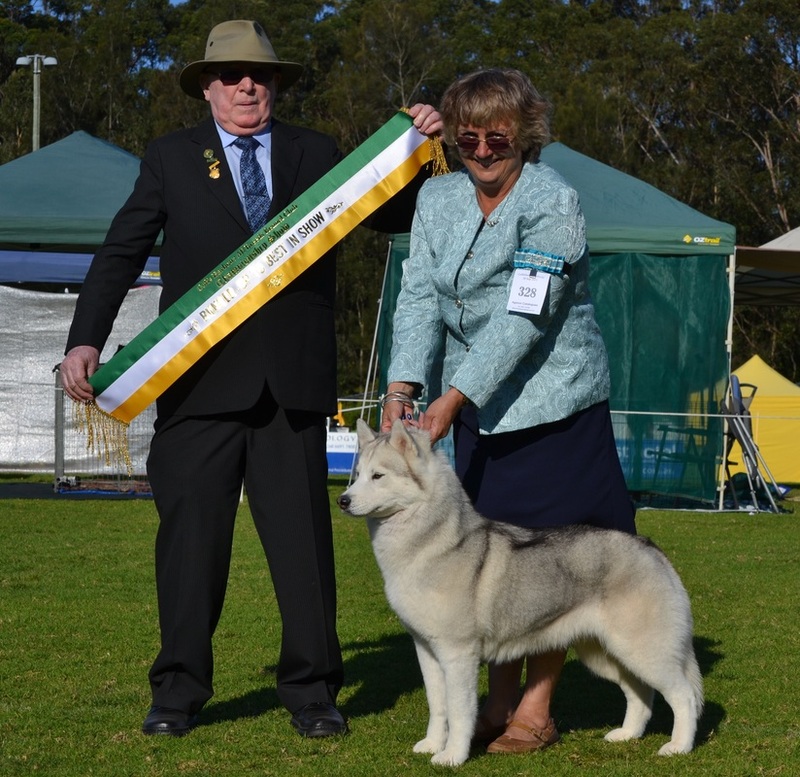 This was made easier with the winning of 2 Best in Groups (and a reserve in show) at Coffs Harbour and again winning the challenge at Hillsborough over several Best in show winning girls. Way to go Myah. We have brought Spirit home and Trouble has joined our siberian show team as well. Both credited themselves well at their first Qld show with Trouble taking Baby in Group and Spirit winning Junior in Group (she nearly took the BCC over Myah). 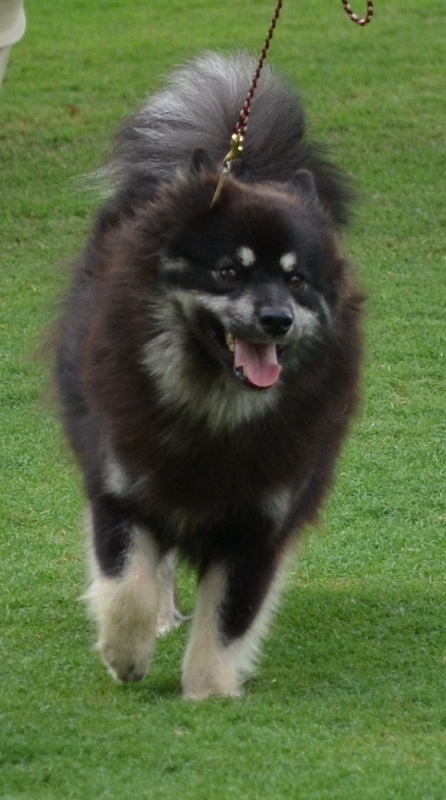 At the start of September we also had some lapphund litters with Aria and Hannah. Photos are now on this website under the Keep and Suklaa pages and can be found on our facebook page. Very sad to announce that Tristan our only entire male toy poodle was taken tragically from us while we were showing in Melbourne. It is more sad as we had never used him at stud so have no progeny from him. RIP beautiful boy. We have done very few shows over these couple of months. Riki did take a runner up to best in group under Mrs Margaret Webber, and both Scandal and Issy have shared the spoils in the junior class. We have the Lappies out at the end of July to get ready for the Ekka. 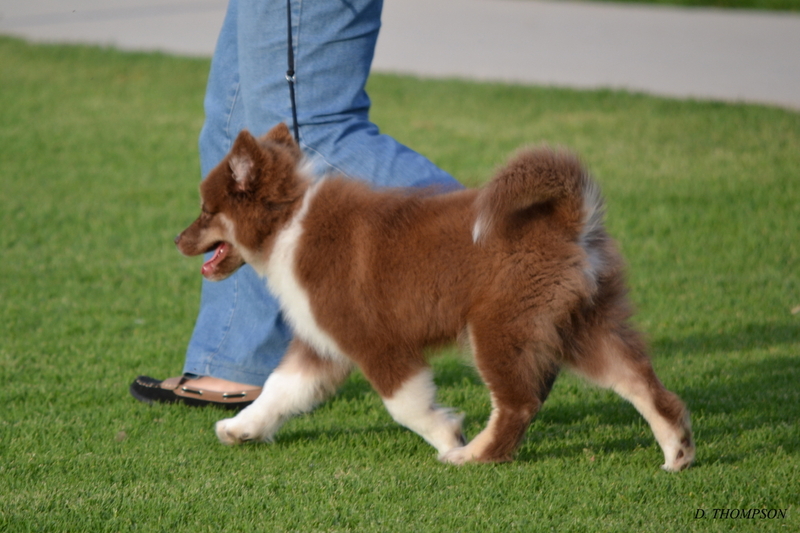 Riki has continued to grow coat and has gained another few Best and Reserve in group awards. He has pleased us immensely with how he is performing. Scandal has also achieved a few more Junior in Groups but is not able to convert them to a class in show. Myah sadly has dropped coat and is bald so nothing much on her to report. Issi returns home from his visit to SA. Thank you Jeff and Jill so much for looking after this special boy for us. At the end of May we have unexpectedly gained a couple of extra pups. Pictures soon of these kids. We have planned a couple of litters and with fingers crossed hopefully will have the patter of little feet around the end of June and July. Wow! What a month we have had. We have managed to attend some shows this month. Proston Agi show was not overly exciting with only Baby In Group with the "loaner" Izzy, and Intermediate in Group with Riki. 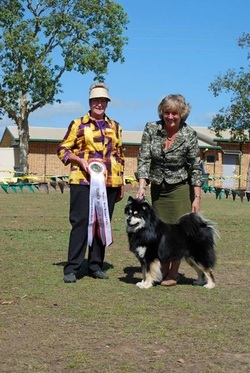 The following week saw me judging at Oakey Agi where my Best in Utility went Best in Show under Norma Zimmerle. Whilst I was enjoying myself there, Mat and Col were having success with Riki gaining Best In Group at the local Murgon show. 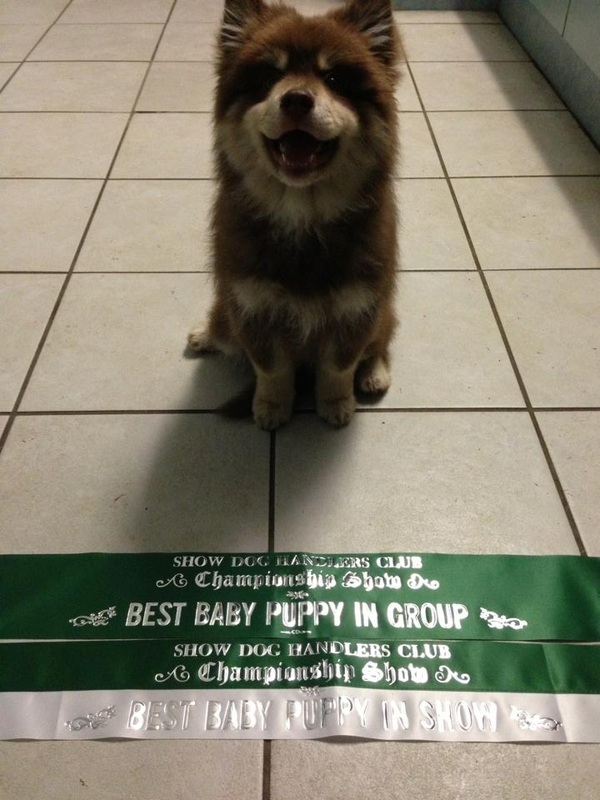 Myah too, won Reserve in Group. A week later, Myah again went Reserve in Group, Riki Best in Group and Izzy won Minor in group at her last show before going back to her breeder. To top off the month, the lappies were taken to the Sydney Royal and each won their classes over competition. 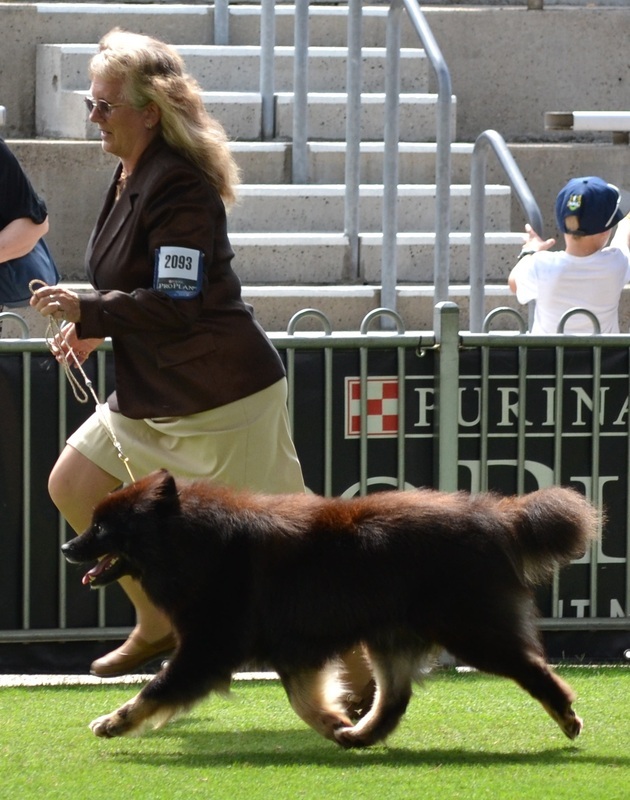 Riki went on to win Best of Breed for the second consecutive year. No shows at all for us this month. All were cancelled due to the floods. We have had time to get some painting done. rip up the kitchen floor, attempt to remove all the staples in preparation for the polishing of the boards after we get the new kitchen in. 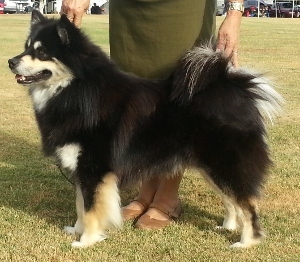 Riki AKA Grand Ch Theldaroy Dare To Diffa started the year with an Intermediate class in Group at the Lockyar Valley KC show on New Years Day show. This was a great start to 2013 after completing 2012 with 8 Best Exhibit in Groups, 18 Reserve Exhibit in Groups and numerous class in group and show awards. Not bad for a little man who has just turned 29 months. Maryborough Kennel Club 5th and 6th - Riki wins BOB over Scandal with nothing in group on Saturday under A Fitzgerald, though on Sunday both won their classes under Mr A Brown but getting nothing in Show under Mr Fitzgerald. How exciting! 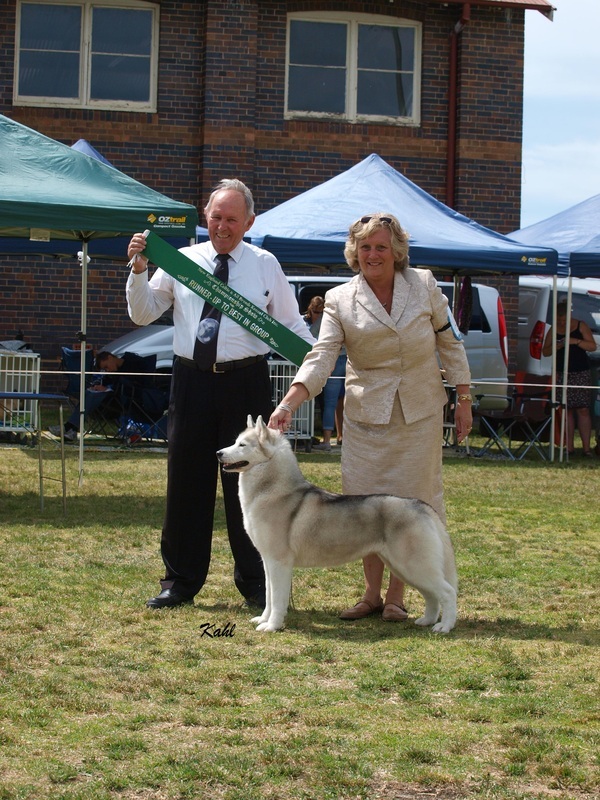 Riki won another Best Exhibit In Group under Mrs Bev Daines at the Burnett Kennel Club show. This provided him with the last group win to achieve his Supreme Championship. Fantastic effort Riki and you are still not 2 1/2 years old. Scandal has done well too, having gained Puppy in Group at these last couple of shows. Show for the end of January and February have all been postponed due to the incredibly wet weather in those areas. Sadly all news and show items for 2009 to 2012 have been lost when i changed over websites. Thank you Shareen for using google cache to help me retrieve the info. I will upload this info but it will be without pictures. Sorry could not retrieve that info too. I do have results for 2001 to 2008 but believe that these are too old to be of interest to many.